The Safety Centre have now added a new selection of floor mounted door magnets to their product portfolio. 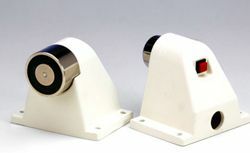 These devices are manufactured by Cranford Controls and are available in both 200 Newton and 500 Newton Holding Force versions. The Floor Mounted Door Magnet comes complete with a keeper plate for mounting on the door.